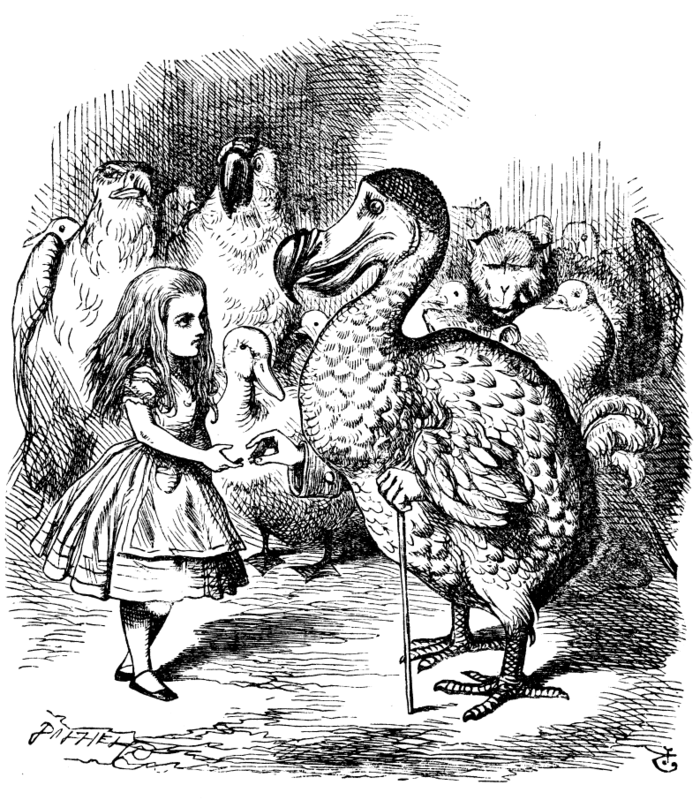 The dodo is a giant, flightless, extinct pigeon that lived on a tropical island in the Indian Ocean named Mauritius. It is famous for dying out and so was given a reputation for being very dumb. However, in February (2016) my colleagues and I published an article in the Zoological Journal of the Linnean Society that looked at the brain of the dodo and compared it to other pigeons. 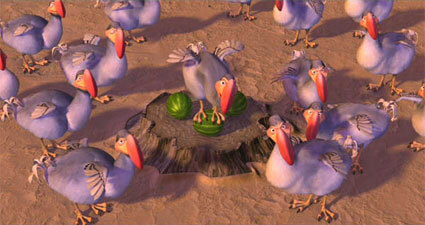 What we found is that the size of the brain in dodos is actually normal in relation to its size. 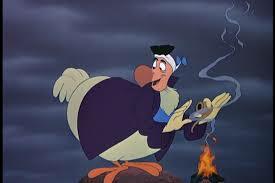 That could mean that the dodo is not actually dumb, but is as smart as a common pigeon. 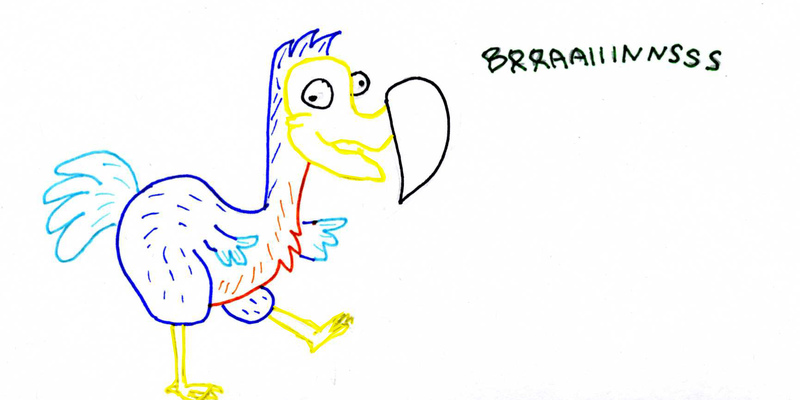 We also found that the dodo and its closest relative, the Rodrigues Solitaire (also giant, flightless and extinct), both have a large portion of their brain dedicated to smell. In the image below showing top views of brains you can see this in the dodo (left) and the solitaire (middle) in the white circle. You can see in the third image that the common pigeon has a small section of their brain for smell. We think that the dodo and solitaire were using their noses to sniff out ripe fruit and other food bits hidden in the ground, instead of relying on vision like most birds do. You might be wondering how we recreated the dodos brain. It’s extinct, after all, and brains and other soft parts do not fossilize! We used their skulls to recreate the brain using a technology called Computed Tomography (CT) scanning. You may not have heard of CT, but maybe you’ve heard of X-rays? X-rays are really cool. They are a form of radiation that can pass through solid objects. When this radiation passes through an object, it is deposited onto a detector that can tell how thick, or dense, the object it passed through was. In this image, the red lines are radiation produced by the X-Ray generator. The radiation passes through the dodo and creates an image on the detector. This is very similar to taking a photo! When you take a photo, radiation from the sun bounces off an object, enters your camera (or cell phone), and is deposited on a detector. The detector can tell what colors objects are based on the behavior of the radiation. In this image, the red lines are radiation produced by the sun. They bounce off the dodo and enter the camera where the photo is recorded. CT scans are made up of thousands of X-rays and special computers can put these X-rays together to make 3D models. We used these models to recreate the brain in the birds we studied, including the dodo.